This week I found my new favourite foody place in London. We'd heard the hype, we knew the back story & for some reason we're still trying to work out why we hadn't been before, but from the moment we arrived we knew we were in for something a BIT special. 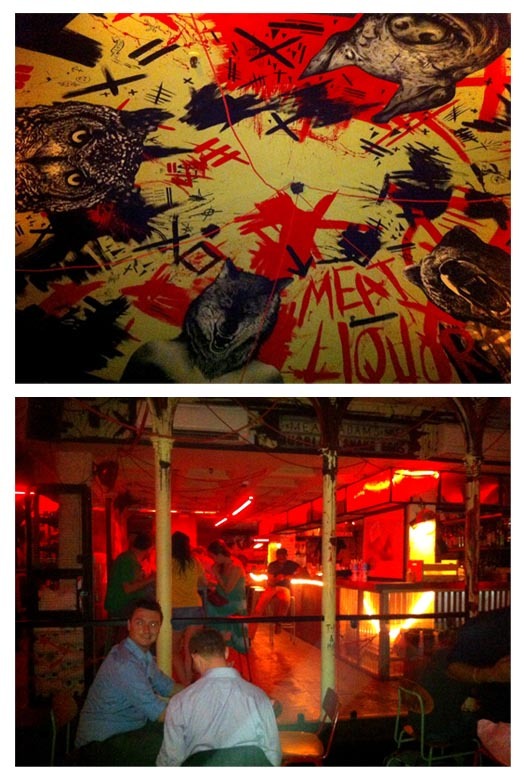 Thursday night me & my dearest friend Lauren went to Meat Liquor, and it was AMAZING. Meat Liquor started off as a mobile burger van called The Meat Wagon owned by Yiannis Papoutsis. When it was stolen he hatched the idea of opening the pop up restaurant "Meateasy" in order to save up enough money to buy another, however it turned out to be such a success that they went & opened up a permanent restaurant just off Oxford Street... & so Meat Liquor was born! We weren't really sure what to expect, we'd heard good things but were worried it wouldn't live up to the amazingness we had going on in our heads. Although, when we rounded the corner & were hit by a smell that made us instantly dribble, we knew there wasn't much chance of us leaving dissapointed. 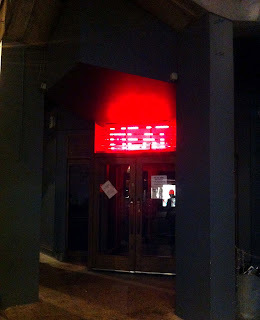 It was about 9pm on a Thursday evening & with Meat Liquors strict no reservation policy we found ourselves joining the back of a small queue outside the nondescript grey building. The only branding, a red neon slatted sign spelling out "Meat". About 10 minutes later there was still a slight wait but we were told we could wait at the bar & have a few drinks. They didn't have to ask us twice & 5 mins later we were standing, jam jar cocktails in hand, taking in the sights and sounds (sights being a selection of amazingly attractive male bar staff, and sounds being REALLY loud music). The cocktail list has been carefully put together by the guys at Soul Shakers - I had a Space Gin Smash (Gin, Lemon Juice, Sugar, Apple Juice, Elderflower cordial, Mint & Grapes) ... it was seriously good! The interior has been designed by interior architects Shed & Graphic Design company I Love Dust. 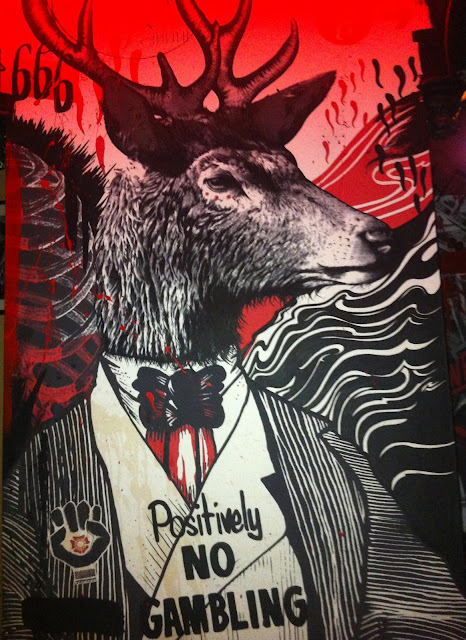 A huge domed ceiling supported by pillars is daubed in crazy black & white murals of animal heads splatted with red paint, giving it a crazy slaughter house feel. 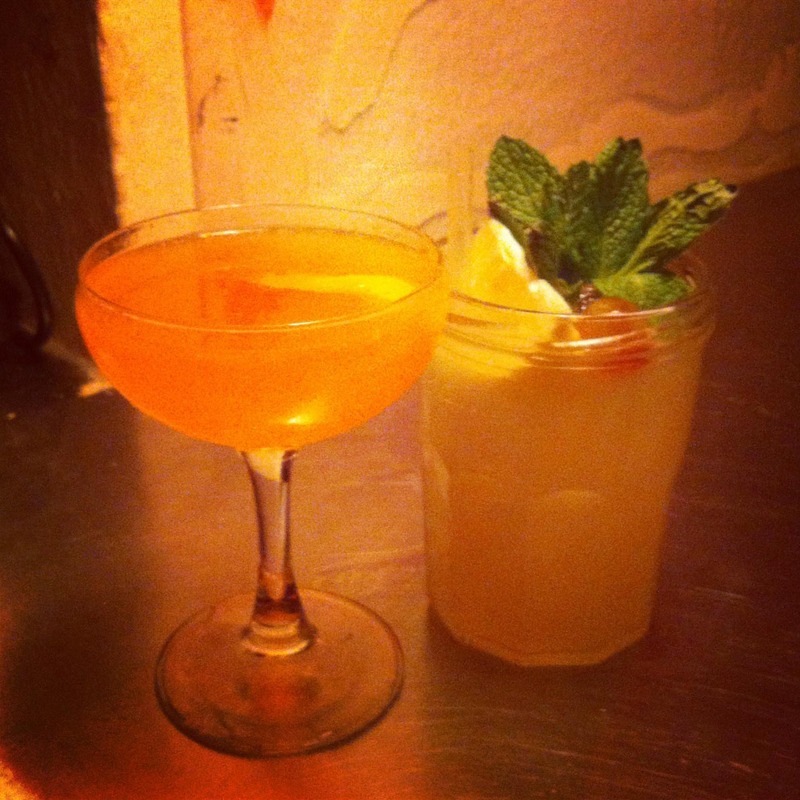 This, paired with the low key lighting of red neon signs & the music blasting from the speakers leaves it feeling less like a restaurant and more like a back street American dive bar, perhaps not for everyone, but me & Lauren were loving it. After about a 10 minute wait we were shown to our table & perused the menu. Simply put together it comprised of a selection no nonsense American diner food, burgers (beef/chicken), cheesesteaks and hot dogs, a few side orders and a selection of "Rabbit food". 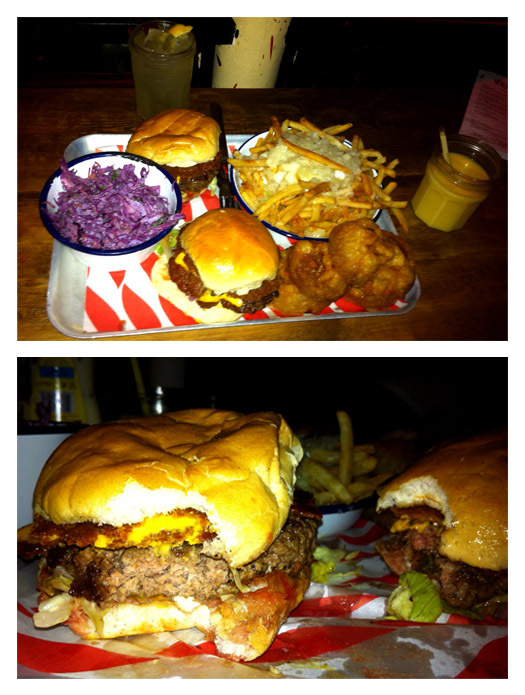 Both me & Lauren went for the Bacon Cheeseburger & we shared sides of cheese fries, onion rings & coleslaw. It arrived all together on a tray with a kitchen roll to mop ourselves up with afterwards. The burger was a meaty masterpiece, the onion rings were MASSIVE, the chips were a huge portion smothered in fried onions & cheese, & the coleslaw was literally the best coleslaw i've ever had in my life. We were left probably about a stone heavier after demolishing the mountain of food, but it was totally worth it, what with the amazing food & the incredible atmosphere. Clearly not a place to go if you're on a diet, or if you want a nice quiet intimate meal with friends and family, but it's amazing no frills food, a great atmosphere and great value for money, despite being in central London. We paid £24 for 2 for a giant tray of food, & cocktails start from £7, well worth a visit!